This enhanced-color space wallpaper shows sand dunes trapped in an impact crater in Noachis Terra, Mars. Dunes and sand ripples of various shapes and sizes display the natural beauty created by physical processes. The area covered in the image is about six-tenths of a mile (1 kilometer) across. Sand dunes are among the most widespread wind-formed features on Mars. Their distribution and shapes are affected by changes in wind direction and wind strength. Patterns of dune erosion and deposition provide insight into the sedimentary history of the surrounding terrain. 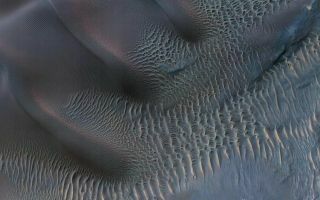 The image is one product from an observation by the High Resolution Imaging Science Experiment (HiRISE) camera taken on Nov. 29, 2011.